Are you an aspirant looking for a career in the banking sector or any government jobs? Here is an excellent opportunity for you given by the IDBI Bank! The bank has opened the vacancy to fill the post of 120 vacancies in various sections like Manager, DGM, AGM, and others. The last date for applying for the post is on 20th April 2019. The candidates can check the notification base and based on the interest and eligibility you may apply for the job posting. To check them open IDBI bank official website, www.idbi.com and click on career followed with current openings and open the right notification and go through the advertisement. 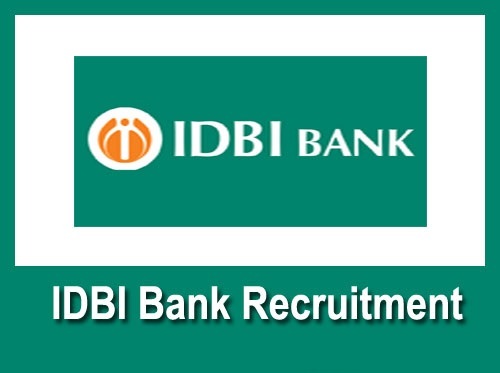 Continue applying for IDBI Bank Various Vacancies Recruitment 2019, by fill the details and uploading required documents, conclude by making the payment through online mode. Stay connected with the official website and registered mail ID and phone number to get the updates regarding the job and also for the following recruitments. Online: The candidate may pay the fee for the applying for the exam for any using any of the online payment modes like Internet banking, Cash Cards, IMPS, Credit Cards, Debit Card (RuPay/ Visa/ MasterCard/ Maestro), Mobile Wallets by mentioning the information the questions asked in the screen. Step 2: Click on the “Careers” and click on the “current opening” you will find the list of recruitments that are available in the instance. Click on the right notification and go through the advertisement completely. Step 3: When you understand them completely and eligible for applying for the posting you may apply for the posting. Step 4: Click on “Click here for the New Registration” and log in with the details and fill the job application with required and appropriate information. Upload the necessary documents and make the fee payment. Step 5: Finally check all the information that you have mentioned is correct and make the final submission. Print the copy for the later use.